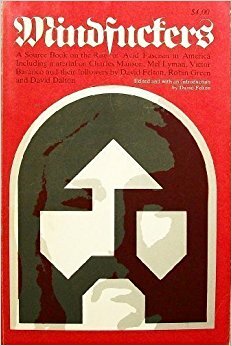 Recently I found a copy of David Felton’s hard-to-find book Mindfuckers: A Source Book on the Rise of Acid Fascism in America in Donlon Books (the full title is Mindfuckers: A Source Book on the Rise of Acid Fascism in America Including material on Charles Manson, Mel Lyman, Victor Baranco and their followers by David Felton, Robin Green and David Dalton) – a book that was removed from circulation shortly after publication in America in 1972. The book, with a cover that ranks as one of the best, consists of articles first published in Rolling Stone magazine exploring the spiritual void created by the comedown of acid revolution. Because it’s hard to find and I was probably procrastinating I decided to serialise it as an audiobook.